Read more here (or click the picture). A great story of development of the "Road Creature", which is based on a XV920 engine, can be found here (or click the picture). The page has the original layout. The original site is not available anymore. Thanks a lot to Harold from North Florida for the hint to this great creature. This TR1 was built in the eighties. Read more (in German) about it here (or click the picture). The page has the original layout. The original site (www.endurogespanne.de) is not available anymore. 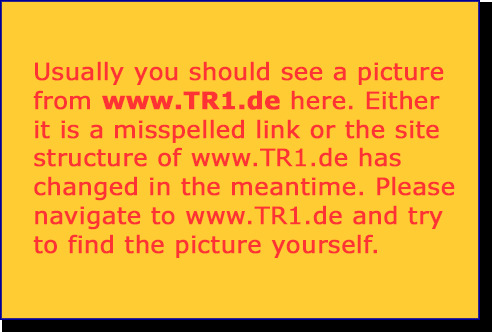 "The TR1 was an excellent motorbike for the epoch, only a few sold unfortunately ..." Read the story of the "Wild Card" here (or click the picture). The page has the original layout and was saved from this site. The original page is not available anymore. At the Twins-Only training in Oschersleben, a very classic-looking bike surprised the entire audience. After the first rounds, some of the 996- or Mille-riders sneaked around it with a contrite face. Nearly 100 HP packed in 175 kg are running quite well. Even if it looks old. Read more (in German) about it here (or click the picture). The original page ist not available anymore. Click here (or click the picture) for a history report of the origins of Yamaha's "American" model tradition. This was originally taken from the Yamaha Japan website. The original page is not available anymore.